Exemplary workers understand what is important to the organization so they put their efforts in the right places, do the right things, and make decisions in the best interests of their organizations. To be exemplary performers, workers need a general understanding of organizations and a specific understanding of their organization. The same goes for Trainers and performance consultants: to develop effective customized training—training that is relevant, useful, and practical, and reflects the organization for what it is—they too need a general understanding of organizations. Both exemplary workers and training/performance consultants benefit from an understanding of relationships between business resources, organizational structure, business strategies, corporate objectives, and performance standards. This understanding of an organization forms the basis for exemplary workers to learn how their line of work and position fits into the organization as a whole. They appreciate how their work affects others and can make better use of organizational resources. Understanding organizations also helps training and performance consultants (and technical writers) to be more effective at designing and developing training that is customized, reflects the business, and has excellent value for the customer. When explaining organizations to consultants new to our firm, I pretend to build a new business. Would the line of business be a service or a product? What is its mission? If the business is a service, then performing tasks is the main way to generate revenue; tools/equipment provide support for carrying out the work. If the line of business uses technology to make products (e.g., petro-chemical industry), then the technology dictates many of the tasks that workers must do. Having resources to achieve specific results is essential but not sufficient for business success. The resources must also be managed effectively. The illustration identifies some key constituents of a business. Of particular interest to workers, trainers, and development consultants are the corporate objectives. 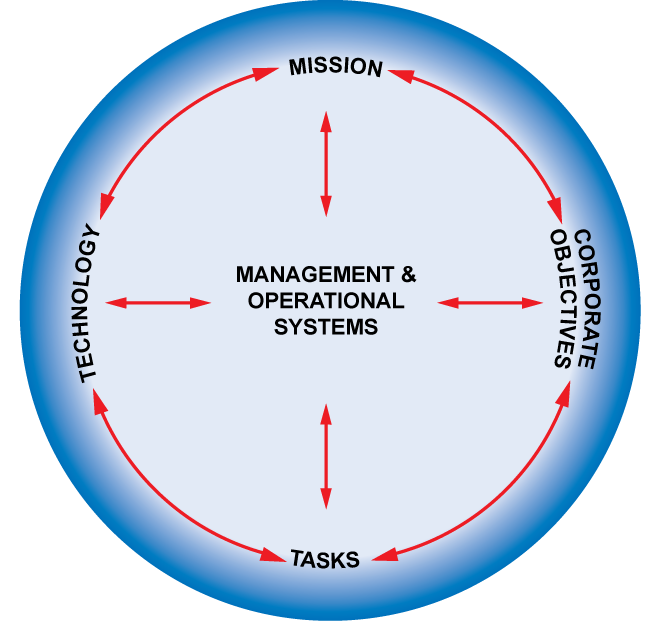 Corporate objectives provide direction for using technology, performing tasks, coordinating work to effectively achieve the mission, and developing relevant training. The following table lists areas of concern common to many organizations for which corporate objectives may be developed. A list of the areas addressed by corporate objectives can be generated by expanding the organization’s strategic business objectives or by using LO-PEMEO (see previous post). Some organizations issue strategic business objectives to identify what it must do well to be successful and to give employees direction about where to put their energy and focus. For example, leaders in an organization may believe reliable service and satisfied customers is essential for business success. Organizations may identify five to eight strategic objectives. Within a department, the list of objectives may be expanded to address issues specific to the department’s mandate. Key Performance Indicators may be created for the department to assess how well the department is doing to contribute to business success. The expanded list of corporate objectives can also be generated using LO-PEMEO—each of the items in the above table relates to one or more of the LO-PEMEO domains. Corporate objectives are fundamental to exemplary performance because they define what is important to the organization, the job, and workers. Corporate objectives provide a formal link between organizational goals and worker performance. Workers can use corporate objectives as criteria for working effectively and efficiently and for making decisions in the best interest of their organizations. Training and performance consultants can use corporate objectives to identify relevant, useful, and practical training content so that the training contributes to business success. For exemplary performance, workers need to understand the relationship between the constituents of the business model. For example, how and how well a task is to be performed is influenced by the technology, corporate objectives, and expectations of the supervisor or manager. The book JobThink provides a detailed explanation of the business model. A strong emphasis is placed on the interrelationships of the constituents. For workers, a practical understanding of their organizations helps them to effectively focus their efforts and make decisions in the best interests of their organizations. The books use an educational design and have exercises to apply the thinking to the world of work. Does this model integrate the key aspects of your organization that you need to take into account when working and making decisions?